Beautiful 6 piece art glass fruits assortment. 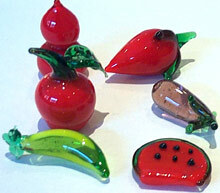 These hand made art glass fruits will look great in your glass decoration cabinate, or just lying around. They make great gifts for any occasions. A galloping rider hopping over a crystalline globe. Measures approximately 9" in length. Graceful eagle about to take flight. Bronze finish. Wingspan is approximately 15". Lovely mermaid holding a crystalline globe. Measures approximately 9" tall. This depicts an Indian hunter chasing down a raging buffalo. Approximately 15" in length.